One of the best ways to learn how to sail is to take one of our fun and invigorating sailing courses! From the city skylines of Tampa Bay to the emerald waters of the Gulf of Mexico, and the tropical trade winds of the verdant British Virgin Islands, Offshore Sailing School provides a variety of Learn to Sail holidays for new and returning sailors on some of the most scenic and exciting waterways in the world for sailing instruction. Learn to sail at one of our resort destinations, on a Learn to Sail Holiday in Florida and the British Virgin Islands where dolphins and manatees play in your wake. Our Learn to Sail courses require no prior experience. All beginner sailing courses are taught by the best sailing instructors you’ll find. Unless you ask for a private family course, our instructors never teach more than four students on each boat. 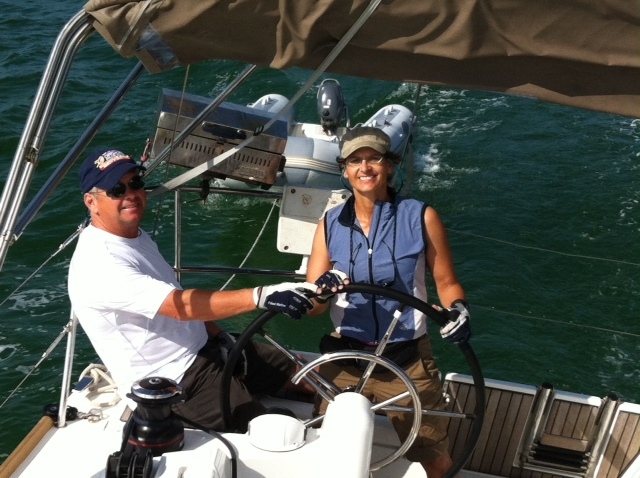 Sailing instruction packages including tuition and accommodations vary by season. We also have sailing lessons just for women only that take you from beginner to confident cruising sailor! These comprehensive 2-day or 5-day courses take you through the intermediate level on vacation or commuting from home. Ready to book your course? You can learn more here. Click on your location choice below to view resort amenities now! Our most popular program takes you from couch to the captain’s chair in seven days, with confidence to start charter cruising or sailing off on your own gorgeous cruising salboat. You earn three US Sailing Certifications and go home with skills and knowledge to take the helm of cruising boats up to 50′. This is the perfect introductory beginner sailing course. Get out on the water with a 2-hour sailing lesson, and discover why sailors have so much fun. Lessons are available at most Offshore Sailing School locations. This information-packed Online Learn to Sail Course mirrors classroom sessions in our 2-day Learn to Sail Certification course with videos, diagrams, interactive exercises, and tests.